The concept of “nation” evolves when large groups of essentially different peoples come to see themselves as having a collective identity and as a community in their imagination. A people’s shared history, their selective memories of places, landscapes, and events, elements of a past remembered or forgotten in common, are crucial in the creation of what Anderson describes as an “Imagined Community.” “Imagined” because heterogeneous individuals and groups, because of having the idea that they share in common memories of the past, a past history, come to see themselves collectively as a polity, community, state, and eventually a nation with a common present and future (Anderson  1991). For Anderson, the idea of an “invented” or “imagined” nation does not mean a “fabrication” or “falsity” as if there is some other social configuration that is a “true” un-invented community (Anderson  1991:6). Instead it means a creation, a created polity, and in this sense all nations are imagined. When imagined communities of people perceive themselves as unified across time and space, they create institutions that legitimate their emerging sense of unity. These are institutions that systematically instill nationalist ideology through the printed media, educational system, census taking, and the mapping of geographical boundaries of the lands they occupy or claim (Anderson  1991:163–178). For example, the initiation of the decennial national census in 1790 was one of the earliest American institutions created as the United States emerged on the world scene. By 1803, the Lewis and Clark expedition was engaged in exploration and mapping newly acquired lands, i.e. by the Louisiana Purchase, west of the Mississippi. Commemoration of the past, institutionalized in laws, celebrated in national holidays with dedicated sites such as museums, national monuments, and national parks all cultivate the political climate for emergence of a nation and sustaining a national consciousness. Independence Day, the legislated declaration of Mount Vernon and Independence Hall as historic buildings, and the dedication of Revolutionary War and Civil War battlefields as historic sites all occurred in 19th century America. The 20th century brought national recognition and commemoration in federal law of a public history and heritage to be identified, cataloged, managed, and preserved as inimitable to the national interests of the Untied States. This section provides a brief introduction to some of the major laws, policy, and guidelines that structure historic and heritage preservation in the United States, and serve as the legal authorities for the National Park Service (NPS) and the NPS Ethnography Program. A textbox highlights the major provisions of each law. A statement of the general significance of the law to heritage preservation follows. Finally, the narrative explains the impact of the law on Heritage Preservation and as appropriate its impact on the Park Ethnography Program. The list is neither inclusive nor exhaustive. For course participants who wish to learn more about the subject, the HPN Learning Resources has a section with Links to NPS and other web sites and resources. “On June 8, 1906…President Theodore Roosevelt signed into law the Antiquities Act. This law was intended to protect archeological sites on the public lands of the United States as resources of significance and value to every American. The goal was to preserve historic, scientific, commemorative, and cultural values embodied in archeological sites for present and future generations of Americans (McManamon 1996)." The Antiquities Act had great implications for the young discipline of archeology, lending the weight of federal law to the scientific basis its leaders were working to establish as a foundation for their practice (McManamon 1996, 2005). By declaring antiquities, scientific objects, and places as public sources of education, scientific information, and/or commemorative value, the Antiquities Act established fundamental policies for the treatment of cultural resources that influenced archeology and historic preservation throughout the twentieth century (McManamon 1996, 2001). The law empowered the President to establish protected reserves of public land, referred to as national monuments, by simple proclamation without congressional action. The Antiquities Act had major impacts on the evolution of heritage preservation in the United States. It set a policy precedent for all subsequent heritage preservation law in the United States including the Organic Act of 1916 that established the National Park Service and, in 1966, the National Historic Preservation Act. Before the Organic Act, in 1872, Congress reserved the spectacular Yellowstone country in the Wyoming and Montana territories “as a public park or pleasuring-ground for the benefit and enjoyment of the people.” With no state government there yet to receive and manage it, Yellowstone remained in the custody of the U.S. Department of the Interior as a national park—the world’s first area so designated. Between 1889 and 1909, Congress, and later President Theodore Roosevelt, followed the Yellowstone precedent. Other sites Congress declared national parks included Sequoia, Yosemite, Mount Rainer, Crater Lake, and Glacier National Parks. Roosevelt used the Antiquities Act of 1906 to proclaim 18 national monuments before he left the presidency, including Devils Tower, El Morro, Chaco Canyon, the Petrified Forest, Montezuma Castle, and others. Congress later converted some of these national monuments to national parks. By 1916 the Department of the Interior was responsible for 14 national parks and 21 national monuments but had no organization to manage them. The Organic Act established the National Park Service to organize and manage these parks and monuments and subsequent additions to the National Park System (Macintosh 1999:1). Section 8 of the Organic Act that allows for addition of units to the Park Service has been amended six times. Section 8 directs the Secretary of the Interior to investigate, study, and monitor the welfare of areas of national significance that may have potential for inclusion in the National Park System, report on threatened landmarks, and submit an annual list of areas for potential inclusion in the System. Section 8 authorizes the Secretary of the Interior to develop a list of areas, based upon special resource studies, theme studies, public petition, and Congressional resolutions, for authorization as units in the National Park System. The section sets forth the parameters to be studied and the factors to be considered in the conduct of the studies. The Low Country Gullah Geechee Culture Special Resource Study is an example of the kind of investigation conducted and reported to support inclusion of an area in the National Park System. 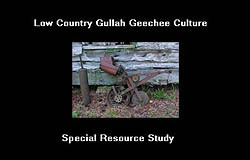 Cover Sheet: Low Country Gullah Geechee Culture Special Resource Study. In May 2005, 453 units are listed as part of the National Park System including (1) International historic sites and national battlefields, national military parks, national cemeteries, national historic sites, national historical parks, national seashores, national memorials, national monuments, national reserves, national rivers, national trails, and national lakeshores (NPS Parks and Recreation 2005). Also included are units that do not fall under any of the latter categories such as the White House and National Mall and national heritage areas (Advisory Council on Historic Preservation 2004:4–13). The Park Service also manages 1,330 historic properties among the 78,000 or more properties listed on the National Register of Historic Places. Of these, 153 are National Historic Landmarks, more than half of which are owned by the Federal government (Advisory Council on Historic Preservation 2004:3). The Park Ethnography Program links its mission and program functions to the NPS mission as derived from the Organic Act mandate to maintain the parks unimpaired for future generations. The Program—under federal and NPS legal and policy mandates—focuses on living people connected to the parks by religion, legend, deep historical attachment, subsistence use, or other aspects of their culture. Guidelines for studies to determine the suitability and feasibility of an area to be added to the system include provisions that require public participation in the process. One of the goals of Park Ethnography is to enhance the participation of people with traditional associations with parks to participate in these and other process in identification of appropriate areas for addition to the National Park System. "Through consultation and research, the program makes their voices more audible—and the resources they traditionally value more visible—in the Park Systems resource and development decision-making processes…The program’s mission is to help humanize and democratize decision-making by addressing the concerns of contemporary peoples with traditional associations to park cultural and natural resources (Crespi 1998/1999 [Reprint 2001])." While the Organic Act created the organizational structure of the National Park System, the Historic Act of 1935, the National Historic Preservation Act of 1966 as amended, and the Environmental Policy Act of 1969 form the central core of federal law regulations governing and authorizing governmental and public historic and heritage preservation activities in the United States.